My husband has a saying. If the weather is cool, crisp and sunny, he proclaims it a "bluebird day." Today was one of the first bluebird days of the fall season, such as it is in southern Louisiana. Not wanting to pass up an opportunity to enjoy good weather, we headed to New Roads, Louisiana. We drove to St. Francisville and took the ferry across the Mississippi River. 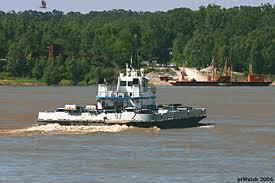 The ferry is operated by the Louisiana Department of Transportation and is free for cars. I did, however, see the operator collect money from truck drivers. On the St. Francisville side there is always a person selling homemade pralines. I have found this to be a very entrepreneurial endeavor! We bought some today and they did not disappoint. The praline vendor has gone high tech in recent years and has added a label to the candy with information about phone orders and mail-outs for those who can't get enough sweetness. Emily's Southern Pralines is the business name. The phone number for orders is 225-635-3377 if you are dying to taste these treats and can't get to the ferry departure site. I recommend buying some pralines while waiting for the ferry. The trip across the river takes just a few minutes. Today the view was enhanced by seeing the progress of the construction of a new bridge connecting the two sides of the river. It is said that it will be the country's longest suspension bridge. Another year will pass before it is finished and I am sad to think that the ferry will be closed when the bridge opens. After all, driving across is much faster and more convenient that the ferry, but not as much fun! Once on the Pointe Coupee' side we drove into New Roads and to Ma Mama's Kitchen. The restaurant is owned by the chef, Donna Ewing. An interesting note is that Donna is also an artist. Her work is exhibited in the restaurant and can be purchased. The decor of the restaurant is very appealing. It is adorned with carved arches, corbels and stained glass salvaged from old homes in the area. For those who like antiques, the restaurant is a treasure trove. 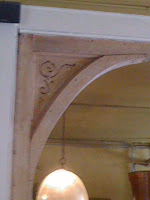 We were very taken by the architectural accents added to the very old building. We arrived at the end of the lunch service, but were greeted warmly and offered hot fresh bread that had just come from the oven. I wondered if they knew we were coming! We expected sandwiches and fried food and did see those items on the menu, but were pleasantly surprised to find some gourmet delicacies from which to select. The waitress suggested we order Creole Shrimp and Jalapeno grits, but we decided instead on their special version of Caprese. The standard mozzarella salad was topped with a creamy dressing that tasted of blue cheese. The garnish was Calamata olives. Delicious! What an interesting twist on this favorite. She also suggested a Spinach Salad that we did try. The Spinach leaves were tossed with sundried tomatoes and tomato basil vinaigrette with shrimp, mushrooms and bacon. The garnish was a hard cooked egg. This was a meal in itself, but we ordered something else, too. 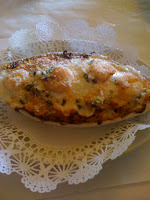 We tried the Shrimp and Eggplant Casserole that was superb. This generous portion was baked in a ramekin and hot from the oven. 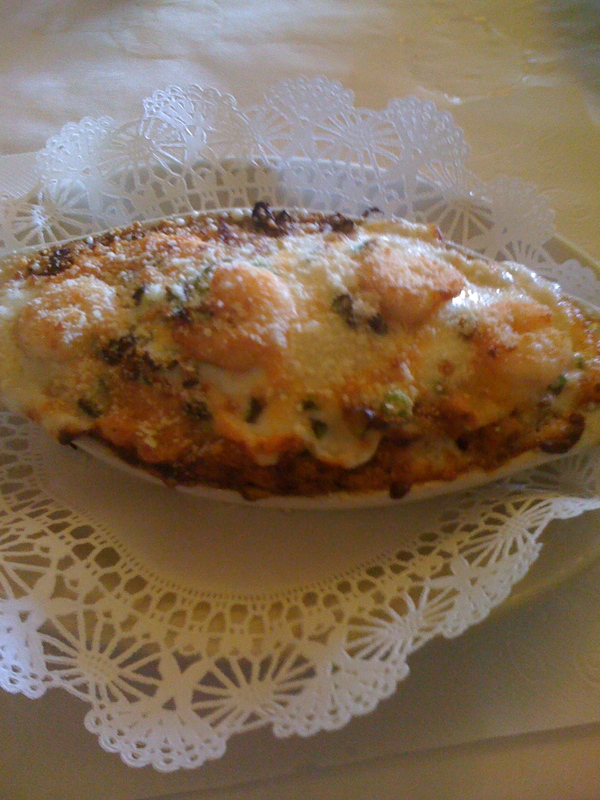 The melted cheese topping made it irresistible and very filling. Then there was dessert. I spied the tall cakes in a cooler just off the dining room. 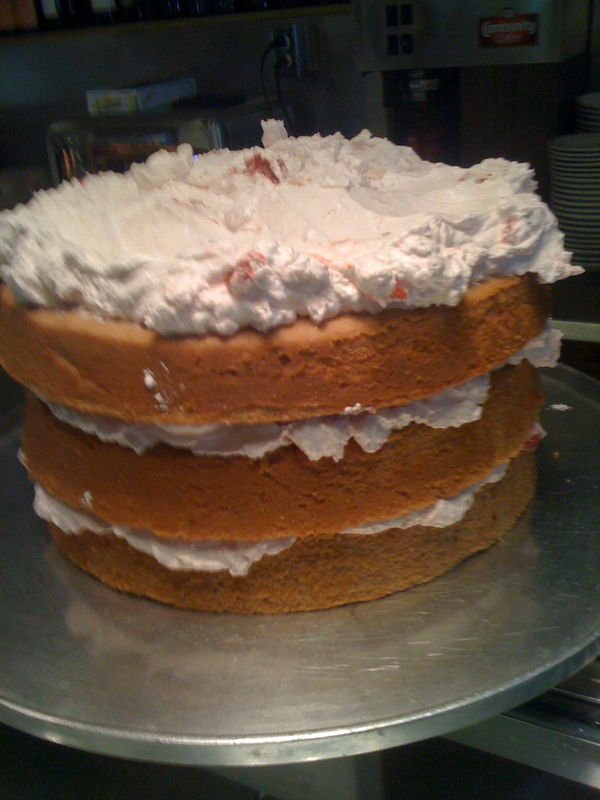 The cakes were about eight inches high and frosted to perfection. 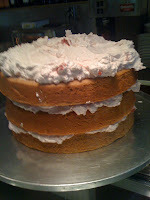 We chose one slice of Strawberry Cake. It was enough for four people, so we brought some home. What began as a quick lunch turned into a feast! We have some special occasions coming up this month, so we plan to go back. Our waitress was so friendly that we felt welcome and felt that we should return again, soon. The address is 124 W. Main Street in New Roads. From the restaurant we traveled a little further down the highway to Bergeron's Pecan Company. 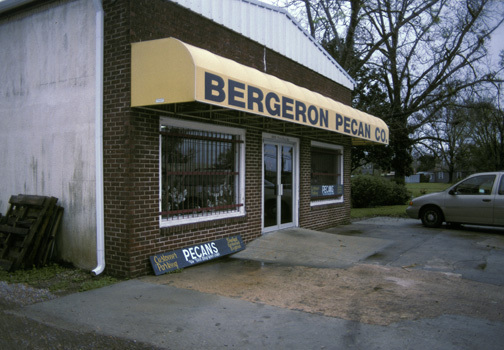 Bergeron's has been selling pecans in the area for many more years than I can count. These can be purchased locally in the grocery stores, but they have a very special variety that has to be purchased at the company home in New Roads. This is the Elliot variety. Each pecan half is about one inch in length. These are perfect for pies and for toasting with spices for the cocktail hour. They cost about a dollar more per pound than the normal size nuts, but are worth it. I had to laugh at the sign on the door of the store. It read: "Eat Pecans, Millions of Satisfied Squirrels Do." Too funny! The pecans from Bergeron's come from pecan groves in the area. The story is that people harvest their pecans and make a good bit of money selling them to Bergeron's for processing. They do mail them out if phone ordered, but they do not have a website. I asked for a brochure to learn that prices were going up and they would mail the new list to me very soon. I feel that I got a bargain by buying mine today. I stocked up. The pecans freeze very well. I have enough to last a year. On the return trip, we missed the road to the ferry, so decided to travel the River Road aka La. 1. I felt transported to another time as my iPhone could not make a connection to the internet, so I could download a quick route back home. I decided to abandon the internet and enjoy the scenery of the levee on my left and almost ready to harvest sugar cane on my right. I knew eventually we would end up in civilization, but this day would be almost gone by then. So glad we enjoyed the bluebird day to the fullest. I just discovered that Bergeron's Pecan Company just celebrated 100 years in business. There is an interesting story in the newspaper, Pointe Coupee Banner. It's online. I agree that the food here is wonderful!! The staff is oh so friendly. The ride on the ferry at sunset was a beautiful prelude to a delicious meal. The only negative was finishing the meal after dark and having no map or gps to get us home! Took a while, but we made it. We'll go again. Thanks, Dot! I love to read your blog! You write so well -- I feel transported to wherever you are. In Atlanta, in the fall, a "Bluebird Day" such as you described is often accompanied by a cloudless, saturated-blue sky that I have always called an "October Blue" sky. I love "October's Bright Blue Weather".. my favorite time of year... though anything would be an improvement on the scorching summer we have had. Thanks, guys and gals, for reading! Hope this beautiful weather keeps up! Your trip sounds like so much fun, and the food and snacks amazing. You're right about the bridge, taking the ferry must make it more of an occasion. I really enjoy the detail you put into your posts. Thanks Dot! Thanks, Fiona, for reading! I enjoy your blog, How to Be Chic" as well. Dot, I'm just getting the chance to read this. You have a style that brings what you are seeing to the reader's eye and heart as well. Thanks for the trip on that "Bluebird Day".